It’s fair to say light is the driver of our existence as human beings. It’s the driver of our physical, spiritual and metaphoric worlds. Designer Micol Ragni’s affection to the importance of light is so strong she dares to take this deep-rooted concept and transcend it into her work. Stating that we are not only dressing our body when wearing clothes but our entity of electromagnetic energy. Not afraid of confrontation, her words ping pong between the psyche and the physique like if we were to talk about today’s weather. In her collaboration with performance artist and musician Maria Forque, she creates a visual essay and puts topics such as the female body and the power of dress into a new ‘light’. In your work, you experiment with the concept of light. What does the concept of light mean to you and what is the importance to talk about it? Light is an electromagnetic radiation that carries information. We are exposed to its radiations every single day. In fact, human beings are electromagnetic creatures and we interact with light and many more types of energies and radiations - along with the information they carry - for our entire life. In a way, we can consider ourselves like antennae, we receive and broadcast information constantly. I am fascinated by the idea that we are these organic, breathing and living devices that receive, process and then shoot out information. What would this look like in terms of electromagnetic radiations? Light can also be interpreted in a spiritual way as in the opposite of darkness, as the good opposing evil, etc. But in this particular case, I mean it in a very practical and material way. We would not be able to see without light. This may sound stupid and obvious but not so much if we think of it in a metaphorical way. What is the light of the mind? We live in a time that is so overloaded of information and where we are so self-absorbed by the virtual identities that we are literally not paying any more attention to whatever it is fed into our eyes and minds. We are literally being stunned and knocked out of information to the point that we have no more mental energy to distinguish what we actually like or not like, what it is good or bad. We need to become more aware of who we are and what is our place on the planet in order to establish new parameters that are relevant for the younger generation. In this prospective, I believe that meditating and understanding what light is for everyone personally, both in a metaphorical way and in a physical way can help us function better as human beings. What is it that principle in life that helps you see clearly and gives you a direction in life? How does this vision reflect on fashion and how are you trying to incorporate it into your work? While working on my last collections, I’ve made it a point to convey the power of clothes, not only on how they shape our individual identity but in how they make us feel when we wear them. 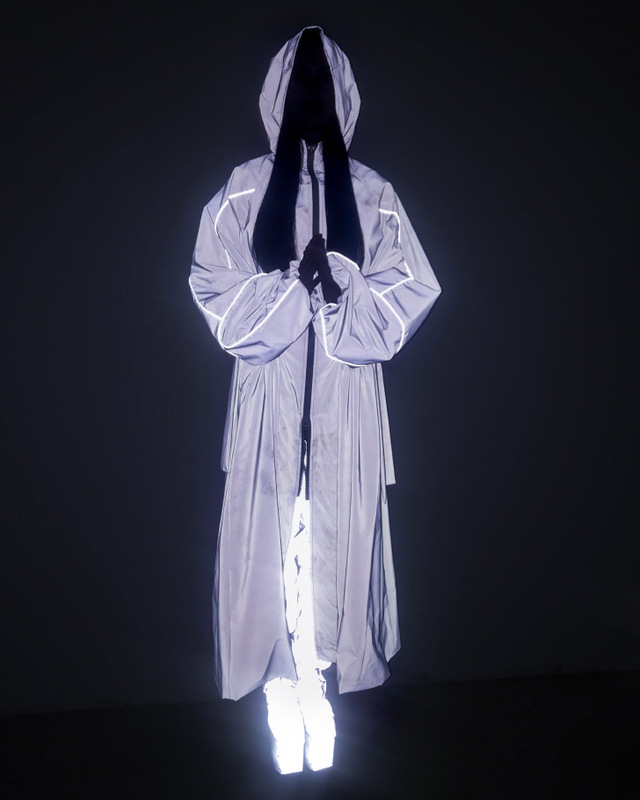 I explored the concept of light using M3 fabrics, I wanted to bring attention to the fact that not only we are dressing our body but the entity of electromagnetic energy that we are. That of which should be regarded as powerful as our physical self. I didn’t want this to do something too intellectual. I think it is a quite a simple connection people can instantly make about wearing a garment of ‘light’ that symbolizes the light coming from within. With a record of working with Bjork, Erykah Badu and Kelela there seems to be a chemistry between your work and their musical expressions. What is your relation to music and is there a shared vision between you and these music artists? I have been surrounded by music for basically my entire life, with my father being a composer I had access to his recording studio and used to spend most of my afternoons there experimenting with various, following that my interests in making electronic music emerged. When I realised that music as a medium of expression was not going to work for me, I discovered I could communicate sound visually. This is what inspires my designs when I first started my brand. The shapes and forms, colours and structures of my designs show the flow and vibrations I felt when making music. So far, my collaborations have been with female artists who are literally my biggest muses in fashion and life. These women unapologetically show who they are through their music, which is what I have always aspired to do with Micol Ragni as a brand. The visuals in this piece are a collaboration with artist Maria Forque. Can you tell something about your collaboration? Maria Forque is a performance artist and musician fighting against the censorship of the female body. She has just been banned from Instagram again and that is very annoying because it shows how far behind we still are with allowing women to work with their body as performers and artists on public platforms. 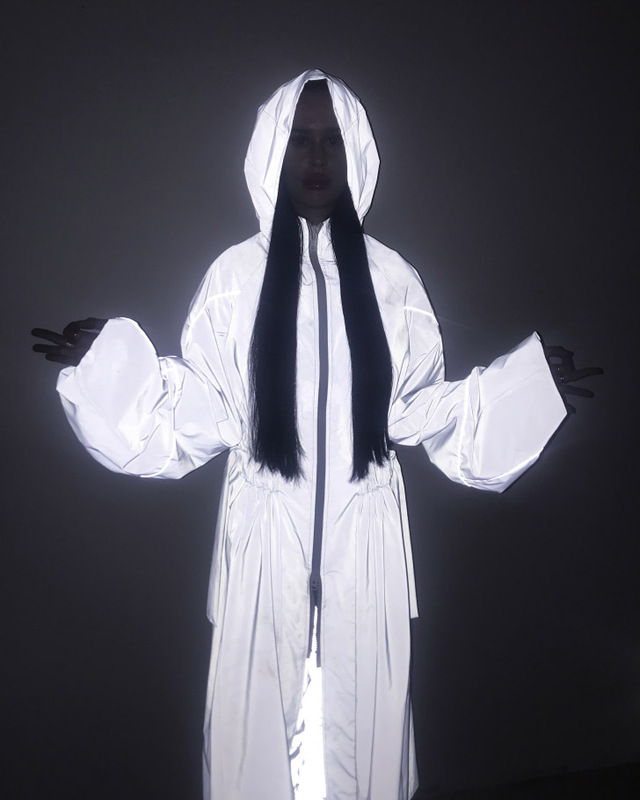 Maria and I both wanted to create a pretext to talk about light and enlightenment by getting her into some of my AW18 pieces made of reflective materials. We hope that people will take a moment to think about what light means for them and hopefully ask themselves some questions like what or who metaphorically represents the light in your life? And do you think women are a symbol of spiritual light? Your light infused work shows references to cyber-culture and future technologies. What do you think will be the effect of technological advances on the future of fashion? It is in my hopes that with technological advancements we can find a way of changing the production of fashion to be more environmentally friendly. The production of new types of fibres artificially developed could help reduce the pollution caused by agricultural production of raw materials to a more sustainable development. I hope we can see these changes in the next few years. Prospecting about the future, where do you see yourself in 5 years? I find it hard to think of where I’ll be in the next 5 years but I only wish myself to still be designing for my brand and to be creating collections that communicate empowerment, inclusiveness and transcendence.